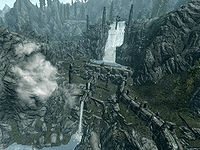 Lost Valley Redoubt is a massive Nordic ruin inhabited by Forsworn and hagravens. It is a short distance almost directly west of Bilegulch Mine, both of which are to the southeast of Markarth and to the northwest of Falkreath. Hagraven #1: "Heart of thorn... bones of the wild... in life, Forsworn..."
Both Hagravens: "...rise from death, Blood of our Blood." Behind them is a word wall which teaches part of the Become Ethereal shout. There is leveled loot on the altar along with a chest in the area. There is a long ledge overhanging two waterfalls at the top, opposite the hagravens and word wall, which is Bard's Leap Summit. There is a lever near the stairs on the level where the large waterfall lands. Activating it causes a boulder trap to go off. Another such lever is a short distance west on the same level, next to a large rock. Beware several tripwires. They set off boulder traps and a swinging mammoth head. At the summit, follow one of the aqueducts to its base to find gold and a random potion. There is a catwalk over the waterfall that overlooks the camp. If you go on it and head towards the waterfalls, you will see some boards hanging off; this is Bard's Leap Summit. Jump and land in the water, and you will see some stairs. Go up the stairs and you will meet a ghost named Azzadal. Listen to his story of his leap, after which he will play you a song. When he is done, your speech skill will level up by two. One silver ore vein is located left of the Forsworn hut on the level beyond the mammoth skull trap. A second vein is one level above the previous, past the first archway by the southern staircase. There is an apprentice-locked chest a few paces northeast of the forge up the rocks, marked by a yellow leafed bush. In the Forsworn hut on the level beyond the mammoth skull trap are three potions and an apothecary's satchel with alchemy ingredients. Just to the north is the treasure chest for Treasure Map V, assuming you have obtained the map. The Briarheart ritual can be interrupted. Killing the Hagravens will stop the spell, and thus the Forsworn's resurrection. Pickpocketing the Briarheart from the Forsworn Briarheart works too. There is an unlocked wooden chest on its side, located by a small pile of rubble on the far side of the catwalk towards Cradle Stone Tower. Killing the two Hagravens before they can raise the Briarheart results in the bodies remaining forever because the quest never gets shut down. The word wall behind the two Hagravens and Briarheart is sometimes bugged. The usual sound and music it makes still play but no word is glowing, thus making the word unobtainable.